Parallels Desktop 14 running Windows 10. For the foreseeable future Corel will continue to offer the entire Parallels product line, such as Desktop, Toolbox, Access, and the Remote Application Server, according to an announcement. The terms of the deal haven't been disclosed. Corel CEO Patrick Nichols described the two companies' products as "highly complementary," and working along "shared business models and strategies" without going into further detail. 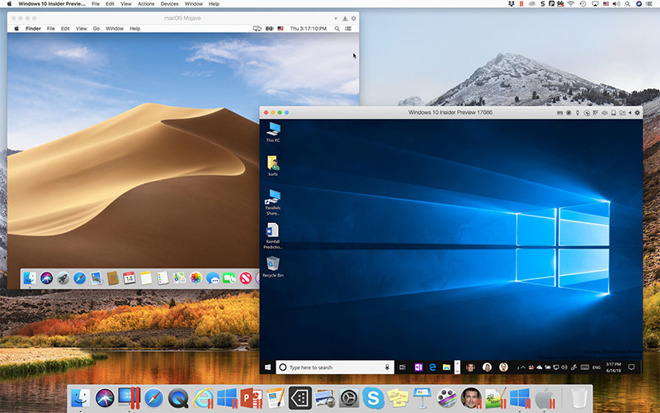 Parallels Desktop lets Mac owners run Windows without dual-booting, even letting Windows apps share files between platforms or launch as if they were native macOS titles. For developers, Desktop can be an essential way of testing cross-platform apps and websites. Corel was once a major player in Windows productivity software, competing directly against companies like Adobe and Microsoft. It still has a large corporate headquarters in the Canadian capital of Ottawa, and until 2006 the city's NHL stadium was known as the Corel Centre. Buying Parallels could help improve Corel's relevance in the 2019 tech landscape. Adobe and Microsoft's productivity suites are effectively the standards in both the public and enterprise worlds, leaving little room for Corel's traditional product lines. I need this software. Don't screw with it! Bertrand Serlet is over at Parallels. Hope that does not change. I had no idea that Corel, CorelDraw, or WordPerfect still were around. Knew about WinZIP but didn't realize they owned it. That was exactly my thought. I had no idea Corel still existed. I haven't heard anything about them or anything they've produced in like 20 years. Corel: Where good software goes to die. Oh lord... CorelDraw and WordPerfect, a fart from the past! Please don't screw up Parallels! Corel Painter has been one of the top digital painting software packages for a long time. Surprised that didn't get a mention. They're still somewhat popular on the Windows side of things at least with consumers. Sign and vinyl design makers use CorelDraw. It's the front end for the cutters. I sent an engraver an Illustrator file and they couldn't use it without converting it to Corel format first. I hadn't heard of Corel for years either. Corel bought a Mac only software product from my own company decades ago to use code for one their PC software graphics package. Had it back in the day. I think it was around 2006. It saved my life. I was in real estate which was Windows-centric! Ugh! I'd just bought an intel Apple iMac and the intel Apple MacBook! Parallels was excellent, albeit a little slow. Which was understandable. Hope the purchase is good for the fine people at Parallels. They still sell a boxed copy of their office suite with WordPerfect and Quattro Pro at Best Buy. I was looking at the box the other day. Apparently they cater WordPerfect to law firms and so it remains popular with lawyers. I used to really like the reveal codes feature. Not sure which surprises me more. A.) Corel is still in business. B.) Corel bought Parallels. Huh? He’s on the board for Parallels which now may or may not mean he has anything to do with Parallels. I seriously doubt he has any input about the product. Corel also owns Toast (for Mac) and Creator (for windows) through their subsidiary Roxio. I was going through all my software to see which apps are 32 bit and will need to be updated or replaced. Whatever old version of Toast I have was one of them. I was about to buy an update when it occurred to me that the last time I burned a disc was so long ago I can't remember how long ago it actually was! When even us creative types aren't using Roxio's software, I can't imagine the future for it being very bright. I've also been clinging to an Epson inkjet printer because it's able to print directly onto discs. I don't know why I bother, since it's been so long the ink cartridges must have dried up by now. Do the jets clog if left unused for literally years, or could it be resurrected with new cartridges, assuming I could even find them after all this time? Oh well, have to see what they do, and decide whether it's worth jumping to Fusion. I don't think VMWare are about to sell out to Oracle or anyone soon. CorelDraw is required for many CNC machines such as laser engravers.